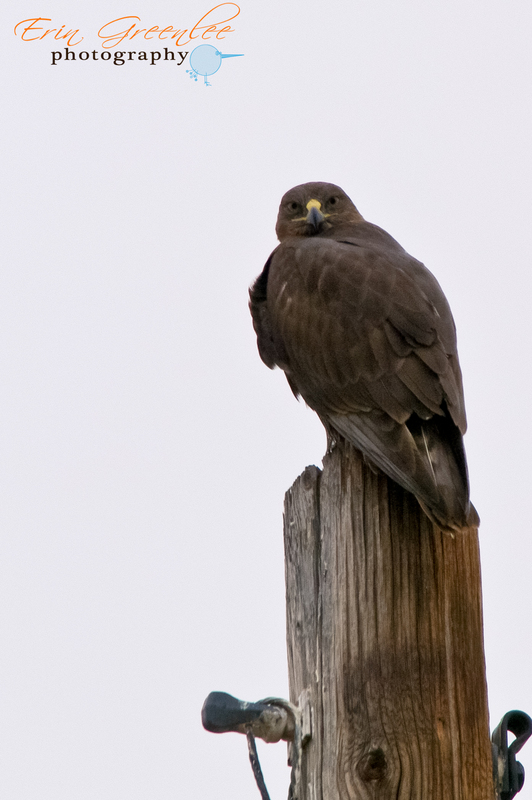 Identifying Dark Morph Birds /Hawks Aloft Inc.
Erin Greenlee, our ornithologist, photographed this bird on a recent trip to Colorado. At first look, there is little to help you identify the large dark hawk. 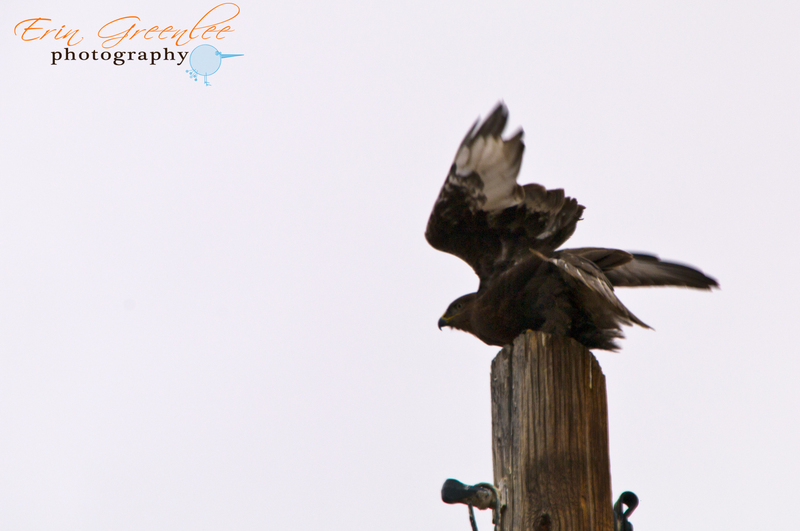 Because it is smaller than the pole on which it perches, it is not a Golden Eagle, the common large dark bird of Colorado. Taking a closer look, you can almost see an iron-colored colored patch on the upper wing. Another clue is the size of the gape (or mouth area). It is bright yellow which would likely preclude a Red-tailed Hawk. The gape also extends to beneath the eye. There also is a hint of soft rusty-gray on the primaries, leading me to think that with all these combined, the bird should be a dark morph Ferruginous Hawk. Indeed, in the second photograph, as the bird takes flight, you can clearly see the light colored tail typical of a Ferrug and the very large gape. Another indicator is the relatively light-colored eye. Ferruginous Hawks generally have a lighter brown iris than Red-tailed or Rough-legged Hawks, the other two large buteos that one might expect to see on a winter day in Colorado. 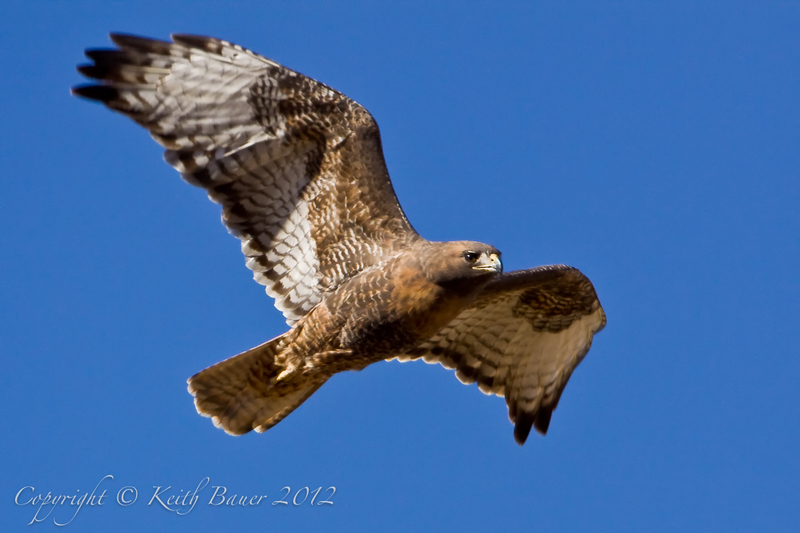 Photo number 3, by Keith Bauer, shows a different dark plumaged bird, photographed in New Mexico. This bird, although dark, still shows enough of the diagnostic field marks of its species to make it easily identifiable. It has a broad belly band and a dark head with very dark eyes. 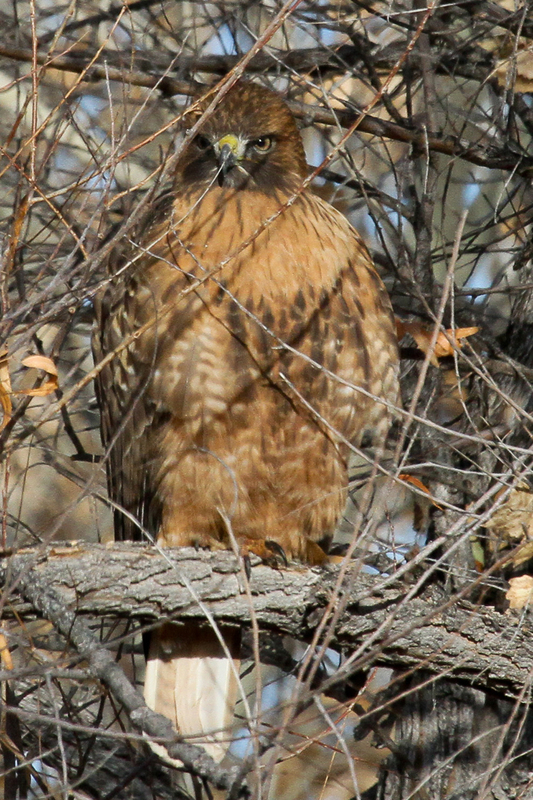 Note that the gape on this bird is considerable smaller than that of a Ferruginous Hawk. 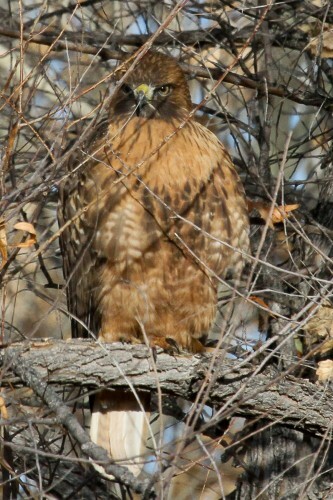 It is a juvenile Red-tailed Hawk as evidenced by the barred tail, and a particularly gorgeous individual. Finally, photo number 4, by Dwayne Longenbaugh, shows yet another plumage variation of a buteo species. This individual, however, still shows many of the diagnostic field marks typical of a Red-tailed Hawk. It has a dark belly band, a dark head, dark eyes, small gape AND it has a red tail! Identifying dark morph individuals is always a challenge!